Class: 1 - Flat water for the most part but careful attention has to be paid to the weather as strong winds can roll off the mountains with little or no warning. 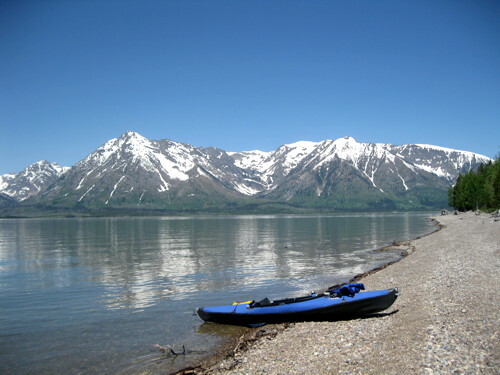 Special Regulations: Permits have to be obtained to paddle in the lake from both the State of Wyoming [$15] which can be purchased at the marina store and National Park Service [$10 for a 7-day permit and $20 for an annual permit] which can be purchased at the NPS office at the Colter Bay Visitor Center. You can also get the form to complain to the park superintendent about the fees at that same office. The alternative is to rent a boat at the marina at their hourly rates. About 40 miles north of Jackson Hole, Exit at Colter Bay Village. Follow Colter Bay Village Road to Colter Bay Marina Road. Turn left at Colter Bay Marina Road. Follow the road to the boat ramp. 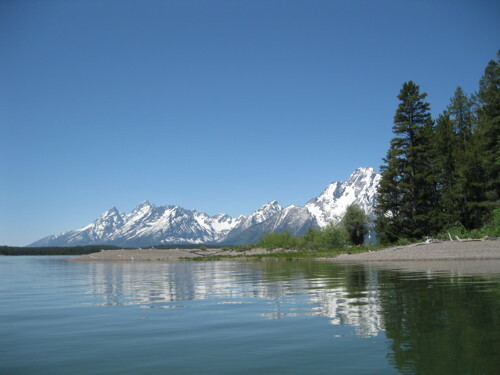 Fee: As noted above, fees are charged by both the NPS and Wyoming to put your own boat in the water. In addition, of course, you have to pay the fee to enter the park itself [$25 per vehicle if you do not have a special pass.] There is no fee to park. Description: The road to the ramp is paved but there is no parking right at the ramp. Drive down to the ramp, drop your boat and gear to the side of the ramp and then go back up the access road to the parking lot, about a hundred feet away. The alternative would be to just park and haul boat and gear down the ramp road. Parking: Parking area is paved and there is plenty of parking since the area is a hub of other activities. 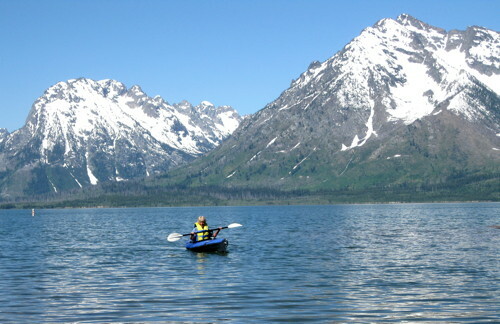 Facilities: Colter Bay Village has a campground with 350 sites, rental cabins, rental yurts, stables, a general store, showers, restaurant, gas station, ranger station and museum, and a marina with its own store where you can buy fishing and boating permits. Security: National Park Service rangers regularly patrol the area. Special Handicap Access: Facilities are all handicap accessible as far as I could see in keeping with the ADA requirements the government has to follow. Heading west from the boat ramp we paddled through the marina area. This is a no wake zone and for the most part the power boaters seemed to obey that rule. 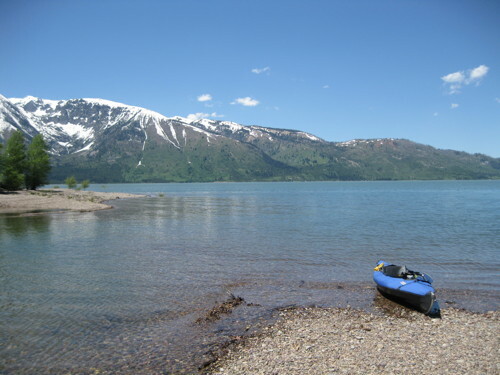 Once clear of the marina area you can head north, south or straight west across the lake to the mountains. 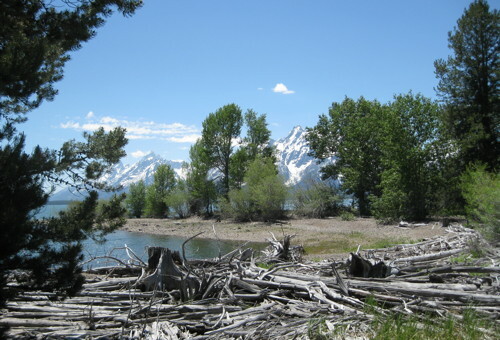 The lake is about three miles across from Colter Bay to the western shore. 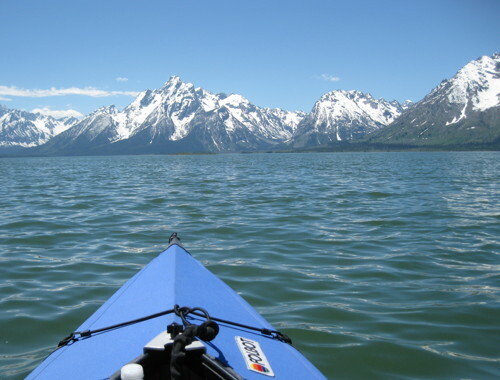 Paddling directly west takes you toward the mountains and an incredible view the entire way. Note that the altitude is over 6,700 feet. For those who are accustomed to living by the ocean as I am, it takes time to become acclimated to the thinner air. Don’t overestimate your stamina in that situation. To the south there are a number of islands and inlets that make for an interesting paddle. The main concerns are the winds that can kick up suddenly on the open water and the occasional inconsiderate power boater. There are countless places to pull onto shore and take short excursions into the forest. Only two issues arose when doing that. First, most of the shoreline is littered with broken rock, so care has to be taken in landing. Some very large sharp edged rocks are just under the surface and there are numerous logs and tree branches floating near shore. Second, there are bears everywhere, so if you do head off into the forest, bring bear spray and stay alert.